The name Sri Lanka, known as Ceylon during the British colonial era evokes images of a far off land known around the world for its tea, and among gem enthusiasts for its rich history as a source of fine sapphires and a myriad of other gems. An island state in the Indian Ocean, Sri Lanka is located off the south east coast of India. It has earned its reputation as a rich source of gemstones, having attracted early traders throughout history from afar including such famous explorers as Marco Polo, who visited the island in the 13th century. My quest this summer was to travel with my wife Carol to this far off land and experience for ourselves the gemstone trade. 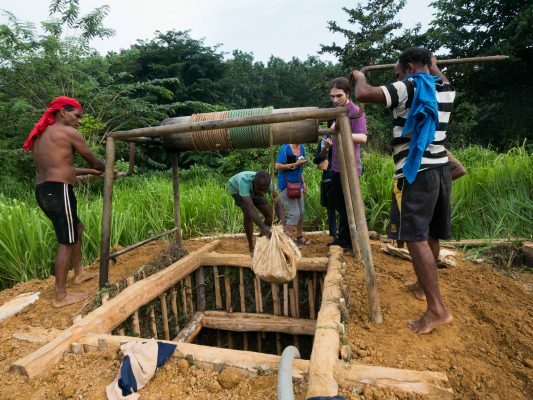 Our journey would take us from the mines to the rough market, observing the craftsmanship including the heat treatments and cutting of gemstones, and finally to enter the realm of the gemstone trader. In preparation for our trip, I contacted gem dealer/cutter, Mr. Buwaneka De Silva of D.B. Enterprise (PVT) Ltd., Colombo, who I knew from visits to the Tucson gem show. Upon arrival in Colombo, Mr. De Silva and his wife Mano were our gracious hosts and gave us a glimpse into their successful gem and jewelry business. I wish to thank them for their hospitality. With a reference from fellow gemologist Matt Winward, I had also made the acquaintance of Sri Lankan gemstone dealer Ivan Ivancic of Adamant International, Colombo. 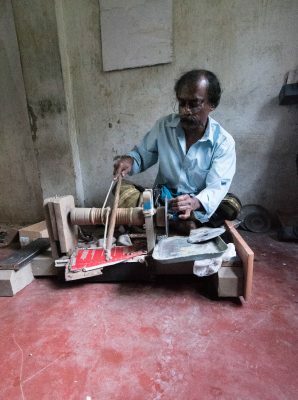 Ivan has lived many years in Sri Lanka and has been in the gemstone trade for the past seven years. He and his partner Zana invited us to join them on one of their buying trips to Ratnapura, the city of gems. What an exciting and fruitful journey it turned out to be! Ratnapura is the capitol city of Sabaragamuwa Province and is located in south-central Sri Lanka, about a three hour drive (63 miles) from Colombo. 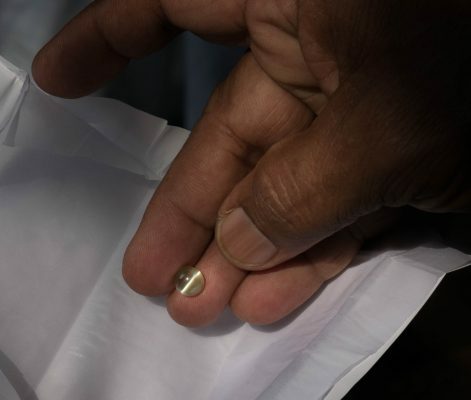 The Ratnapura district contains the highest concentration of gem deposits in Sri Lanka, the name itself derived from the Sanskrit words “ratna” (gemstone) and pura (town). Upon arrival around mid-day, Carol and I were met by our hotel host and whisked off to our hotel, The Gemfields Rest, in the most famous of local transport vehicles, the tuk tuk. Only just recovering from heavy flooding that occured two months earlier, the hotel owners were very happy to accept us as guests and we were more than pleased with the comfort and service of their recently built boutique hotel. After settling in, we made our way by foot down the local lane, across the foot bridge that spans the Kalu Ganga river (source of heavy flooding) to arrive at the gemstone trading district. Spanning no more than a few short blocks, Council Avenue is lined with gemstone trading offices, in addition to cutters and “cookers”. 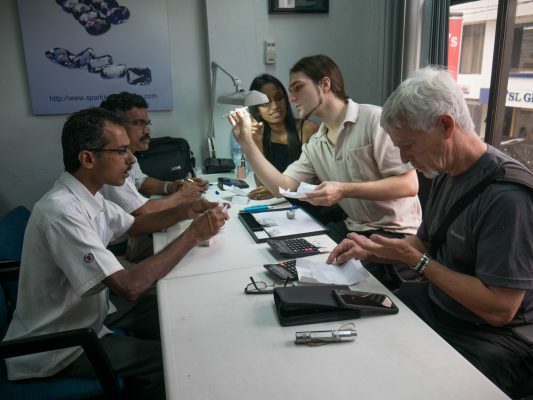 Ivan and Zana had arranged to meet us at their local contacts office, that of Mr. Lakshman Vithana, who had arranged our appointments with the local gem dealers. Climbing up the narrow stairway, we made our way to the small office, leaving behind the hubbub of the street below already awash with gem dealers shoving stone papers at us and asking for our attention. Arranging ourselves along a north facing window, our “work” began. The stone dealers were brought into the office a dozen at a time, lining up to take their turn showing us their wares. 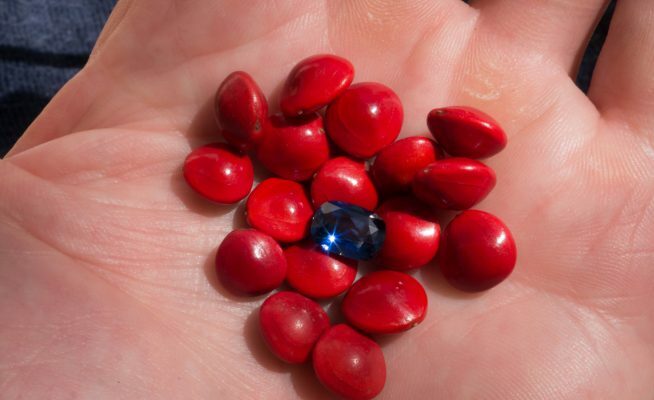 Mr. Vithana had put out the word that I was looking for star sapphires/rubies and cats-eye chrysoberyl. Ivan was looking for specific sapphires. After the first four hours, I had settled on two stones, neither star nor cats-eye, as I found the size and quality of acceptable stones too pricey. As yet Ivan and Zana had found no stone of their liking. This gem buying was going to be harder than I thought! For the next two days Carol and I would meet Ivan and Zana at the office at 10am and go through the same process until 4pm. Parcel after parcel was brought to us but by day three I had purchased only five gems. Ivan and Zana had to spend a fourth day in the office to find the stones that they were looking for. What I took away from this experience and give my gratitude to Ivan and Zana were important skills for a gem dealer, the fine art of staying focused on what you are shopping for, settling only for the best quality (if available) and the art of negotiation. The experience developed my gem grading expertise, focusing attention on all factors of a gems beauty, including shape, symmetry, finish and of course colour. 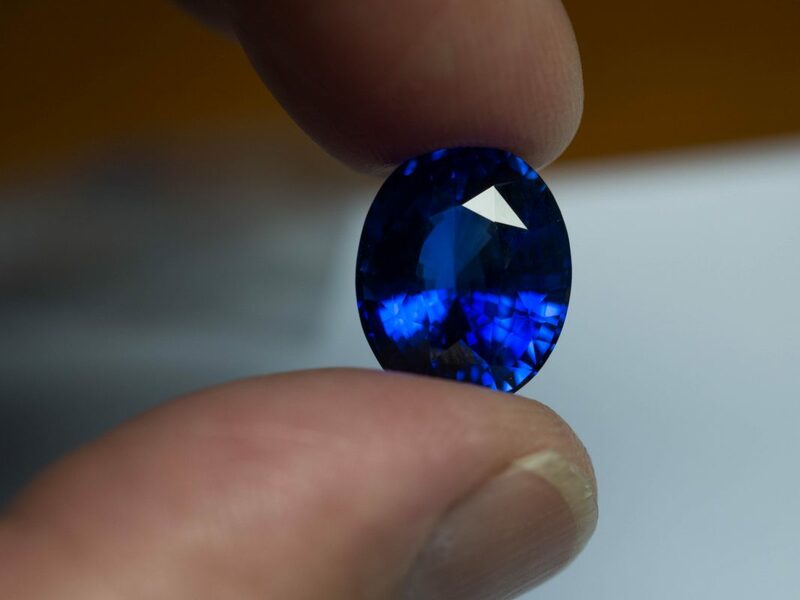 Having spent more time in the buying office than expected, I was concerned that we would not have the opportunity to see other aspects of the gem trade. Fortunately Mr. Vithana had arranged a visit for us to an operational artisanal mining pit. Wading through tall green elephant grass, surrounded by farmer’s rice fields, we foll owed the sound of a diesel engine now pumping water from one of the older mine shafts. A few hundred feet away there was a new shaft being excavated. Perhaps 20 feet deep, the mine was being worked by three men, two manning the hand winch at ground level and the third man down the “hole” with pick and bucket. The bags of soil were brought up one bag at a time, then emptied to the side and lowered again for the next load. 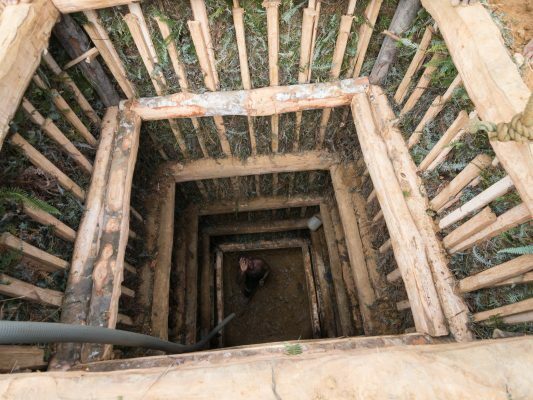 The mine shaft had to be reinforced with a framework of rubber tree wood and local ferns to prevent collapse. After reaching the gem bearing gravel level a horizontal shaft is often dug. The physical work in a hot and humid climate is intense and dangerous. We heard from one dealer of a recent tunnel collapse and the death of several miners. As this mine was in early operational stages, we did not witness the processing of the gem bearing gravel. However there was evidence of the gem processing equipment, such as bowl-shaped reed baskets used with water to separate the gem material from the silt. Our short glimpse into the life of a Ratnapura gem cutter came by chance while walking back to our hotel one evening. Along Council Avenue one can spot numerous open front “shops” where lapidaries, sitting cross-legged on the floor, are hand cutting gemstone rough. This one evening Carol and I were encouraged to enter the cutters shop where we witnessed a gentleman using a bow driven grinding wheel, shaping a cabochon stone on the end of a dop stick. Such rudimentary tools, yet days later a dealer/cutter presented me with a fabulous cats-eye recently finished on the end of such a stick. As the saying goes.. “If it’s not broken, why fix it!” This technique has been around for millennia and for cabochons at least the finished product can be first class. Perhaps our most mystical experience in Ratnapura, if not the most photogenic opportunity, was our visit to a local gem cooker’s “lair”. I say lair as this was the impression it gave. After being directed down a very thin flight of stairs into the basement below, the dark, shadowy atmosphere of the featureless room left me in wonder. Sitting cross-legged on the dirt floor in the centre of the room was an elderly gentleman, the “cooker”. He had already finished his work for the day but agreed to give us a demonstration of his art. 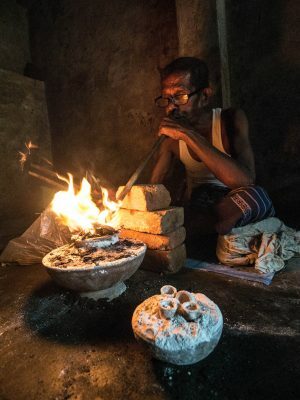 After placing a sample gemstone in a small white clay crucible and adding a pinch of alum, he lit a small fire among some pieces of black charcoal under the crucible. Stoking the fire, blowing through a long pipe, the cooker would slowly bring the temperature of the crucible up to the level required to treat the particular stones at hand. What amazed me was that the cookers have to work in shifts, sometimes blowing hours on end to hold the temperature steady at a certain level. The final act of treatment seemed to be a prayer made by the cooker for a successful result! Our visit to Ratnapupura ended the following day when we bade farewell to our new found friends, Ivan and Zana. We still had four weeks left of holiday to explore what is a fabulously rich and diverse country. From fine beaches to cool mountain tea plantations and ancient temples, Sri Lanka is definitely worth putting on your bucket list! This entry was posted in Uncategorized and tagged Ceylon, diamond mind, jewelry appraisal, sri lank.